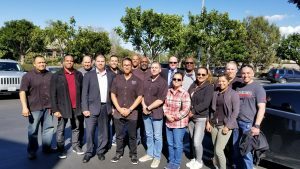 LOS ANGELES — On Monday, March 26, the Los Angeles Airport Peace Officers Association (LAAPOA) and Los Angeles Airport Supervisors Association (LAAPSA) met for the first time in more than 20 years. This police labor summit was the first of its kind in the history of both organizations. LAAPOA represents over 425 line officers, and LAAPSA represents more than 90 police-supervising sergeants and lieutenants at the Los Angeles World Airports (LAWA). The meeting of these organizations reflects the need for all LAXPD sworn and civilian organizations to work together as air traffic and passenger levels rise, the airport continues to expand and modernize, and the area hosts national and international events that bring the focus of the world, in both good and challenging ways, to Los Angeles. LAXPD is the proprietary police force for Van Nuys Regional Airport (VNY), one of the busiest general aviation airports in the world, and Los Angeles International Airport (LAX), the second-busiest airport in the United States. These police officers oversee more than 200,000 passengers daily and over 85 million annually, and protect all airport facilities, surrounding businesses and some residential areas, including those that are part of the current $15 billion modernization effort undertaken by LAWA at LAX. Through these modernization and expansion plans, LAX is preparing for increased numbers of passengers during future high-profile events that will bring an additional influx of travelers to the Los Angeles area. Most notably, L.A. will host the 2028 Olympics. The area is also in contention to host the FIFA World Cup in 2026 and is seeking to host a Super Bowl, with the neighboring city of Inglewood recently becoming the home to two NFL teams after a 21-year NFL absence from the region. These events, as well as recent acts of violence throughout the country and the spate of terrorist attacks around the globe, require the members of LAAPOA and LAAPSA to band together. Whether guarding against terrorism, as our brothers and sisters at the Port Authority of New York and New Jersey police did during 9/11, or responding to senseless acts of violence, such as the November 2013 shooting at LAX, it is incumbent on LAXPD police officers to advocate for safety at our airports and for the respect and value of LAAPOA and LAAPSA members with the public and airport management. This airport police summit between LAAPOA and LAAPSA came about as the result of several long- and short-term issues that the members of each organization have raised with their leadership. They include police staffing levels and equipment needs to keep up with the LAX expansion, the lack of internal LAXPD promotions to higher-level leadership ranks, promotions given to outside candidates who have no airport policing experience and are from much smaller policing agencies, and disparity in compensation (pay and benefits) between LAXPD officers and City police. LAAPOA and LAAPSA are concerned that these unresolved matters will continue a pattern of practice by LAWA that must be broken to promote a strong airport police force for the safety and security of the millions of people who pass through LAWA airports annually. The Los Angeles Airport Police Supervisors Association (LAAPSA) is the recognized representation association for the lieutenants, sergeants and fire captains of the Los Angeles Airport Police. For more information on LAAPSA, please visit www.LAAPSA.org.